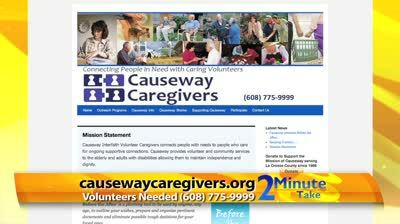 Volunteer Intake Form | Causeway Interfaith Volunteer Caregivers, Inc.
You must abstain while recipient present. How did you hear about Causeway? Please provide any information about yourself that will help in finding a lasting match. In what geographical area(s) are you willing to volunteer? Errands Bank | Post Office | Repair of Item | Pharmacy | Veterinary | Medical Appointments | Etc. Shopping Grocery | Clothing | Shoe | Household Items | Pet Needs | Health/Pharmacy | Holiday | Etc. Indoor Home Chore Wash Windows | Storm/Screen | Light Bulb| Garden/Bushes | Light Repairs | Etc. Outdoor Home Chore Wash windows | Raking | Snow/Ice Treatment | Wedding | Pruning | Etc. Causeway does not allow the use gas powered tools unless volunteer and recipient assume responsibility. Reading Read a book, newspaper, magazine| Find Books on Tape | Library Outings | Etc. Bookwork Sorting Mail and Papers | Organizing Papers for Payment | Filing | Correspondence | Etc. Visits Phone calls | Crafts | Baking | Cards/Board Games | TV Program/Movie | Scrap booking | Etc. Outings Drives | Food/Coffee | Points of Interest | Social Events | Movie | Parks | Walk | Church | Etc. As a volunteer within Causeway Interfaith Volunteer Caregivers, Inc. you share your time and talents by being matched with a person who has requested a volunteer. In order to ensure volunteer safety and the quality of our mission work, we ask you to please read and respond to the following questions. Do you and will you maintain health insurance for yourself? Do you and will you maintain vehicle insurance? Note: Failure to volunteer within guidelines may make you ineligible to volunteer. We thank you for your participation in Causeway Caregivers!